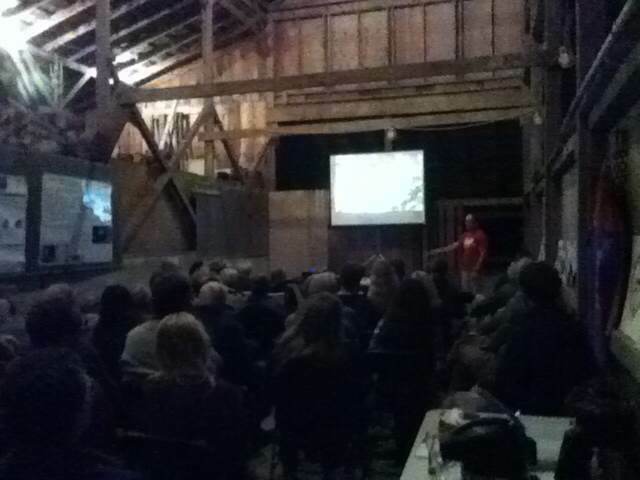 The presentations continued into the evening, leading us to gather under the starlight in this charming barn to listen to this talk on the travels of biologist Jared Wolfe to Equatorial Guinea. The excursion led to the record of several new species for the country and inspired the development of bird research in a region left largely unexplored. Put a bunch of bird nerds together in a wildlife refuge with some of the field’s top ornithologists and what do you get: the Western Bird Banding Association Annual Conference. The day I arrived at the Klamath Bird Observatory, my supervisor laid out a piece of paper and told me to sign my name. At the moment, numbed by the long drive from the coast, I absently scribbled the obscure outline of a printed identity on the line. I figured that I would find out later exactly what it was for, and partly hoped I didn’t just sign my life away. Now, sitting here on a balcony in Arcata I am watching egrets and White pelicans elegantly take off from a salt marsh, chuckling at my fortune to be in the company of ornithology’s rock stars. Just behind me is an ornithologist who has plunged deep into the unknown jungles of Equatorial Guinea to discover dozens of new bird species and launch the foundation of a country-wide initiative to study endemic Neotropical bird species for conservation. In the other room is C. Johnson Ralph, a founder of both Humboldt Bay Bird Observatory and Klamath Bird Observatory. The man is legend–an ecologist who has inspired legions of scientists to dedicate their lives to the conservation of avian wildlife. On Friday night I shared a laugh with John Alexander, another founder of Klamath Bird Observatory and a pioneer, recognized nationally for the study and management of Western bird species. This was only a few of the impressive set of ecologists, ornithologists, researchers, and bird enthusiasts that I made acquaintance with during the conference. In one weekend, a whole world of science was opened to me and I am helplessly consumed by its eminence. The WBBA Conference was a three day bird extravaganza, a meeting place of birders from all over the Americas coming together to exchange ideas, techniques, and information on research in the hemisphere. The conference featured table discussions of data collection methods, tutorials on how to handle raptors, first aid and rehabilitation tips for injured birds, and presentations of Master’s projects. One of my favorite papers to learn about was on non-lethal controls of predators like the Stellar’s Jay. The Corvids are marked by their intelligence, capable of caching 100’s of nuts and seeds for later consumption. Stellar’s jays are nest predators of Marbled murrelets, a seabird that nests in the canopy of redwoods. To prevent the Stellar’s jay from eating murrelet eggs, a Humboldt State University researcher coated eggs with a non-lethal substance that would cause the Stellar’s jay the very unpleasant experience of vomiting. As no species likes to vomit, the Stellar’s jay would then effectively avoid the murrelet eggs, associating the previously tasty morsels with a negative experience. This work is cool because it prevented policy makers from instituting lethal controls of Stellar’s jay as a means of protecting the endangered Marbled murrelet. This was just a taste of the work featured in the conference that successfully rippled the world of ornithology. A main component of the event was the certification of student and volunteer banders. The WBBA tests the skills of trained volunteers through the Bird Bander certification. Achieving this level of proficiency will allow the recipient to apply for federal permits to run banding stations for the study of birds. My colleagues all went through and passed the certification, a long morning of demonstrating their skills at safely handling and processing birds for scientific study. I am so happy for all of them–their hard labor and dedicated studying paid off! With this professional certification, one of my fellow banders will be returning to Peru to apply for permits and grants for a community-based bird observatory in the Andean Highlands. Another will be flying to Mexico to launch a bird banding effort at their observatory. Their work will surely help to fill in gaps of understanding about the breeding grounds of Neotropical migrants and help policy makers region-wide make wise decisions about the management of habitat critical to the survival of the birds we love.